Since my sister's birthday was coming up, I asked her what kind of cake she wanted me to make. 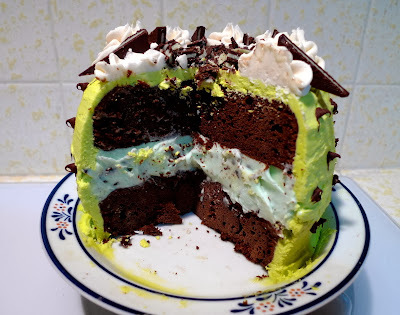 She replied that she wanted a mint chocolate chip ice cream cake. I had never made an ice cream cake before, but, your wish is my command. I used my go-to chocolate cake recipe and baked it in two smaller cake pans. To form the ice cream layer, I lined one of the pans with plastic wrap, filled it with the ice cream, then froze it. It worked out perfectly. The ice cream layer fit right on top of the cake layer, no mess, no fuss. I then froze the cake and ice cream layers to prepare the cake for frosting. Here's where the funny part came in. So, I envisioned this gorgeous cake in my mind. 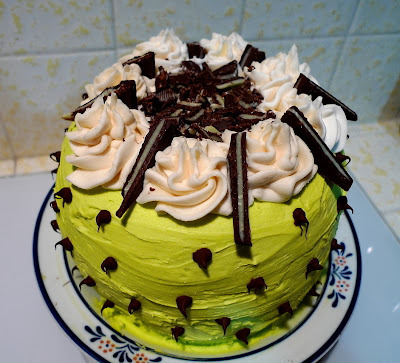 I was going to cover the cake with some delicious ganache, all dripping down the sides, contrasting with the green of the ice cream, etc., etc. But, when I told my sister about my idea, she said she didn't want any fancy topping, she just wanted a simple buttercream frosting. Okay, then what about chocolate buttercream? "No, not chocolate," she said, "I want vanilla." Vanilla??!!! Not my first choice, but it is her cake after all. Then, she tells me that she wants the frosting to be colored purple. Okay, now I had to put my foot down. Vanilla frosting you may have, but I am not going to color it purple. Purple with the green and the chocolate? Really? 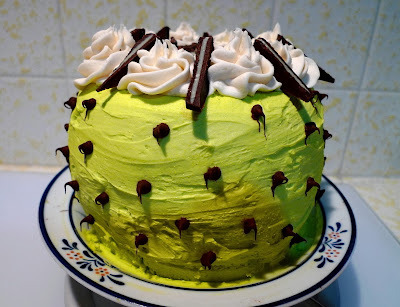 So, she said she'll have green frosting instead. I told her that the only green food coloring I had was kind of a froggy, psychedelic green. To my surprise, she liked it. So, there I was frosting my cake with this green frosting and wondering if either of us was a little crazy. I dressed up the top with some Andes mints and was ready to call it good. But, then she said she wanted chocolate dots on the side of the cake. "Okay, I'll see what I can do." As I piped on the chocolate dots, I was amazed to see that it really looked kind of neat. In fact, the dots looked like mini chocolate chips and made the cake look like a giant scoop of mint chocolate chip ice cream. Very cool. My sister took one look at the finished cake and was thrilled. And, to top it off, the cake tasted every bit as good as it looked. I have a feeling this won't be my last ice cream cake if she has anything to say about it. Grease and flour two 6-inch round cake pans. Cut out two parchment paper circles to fit inside the pans and grease and flour the parchment paper as well. Set aside. Preheat the oven to 350F. 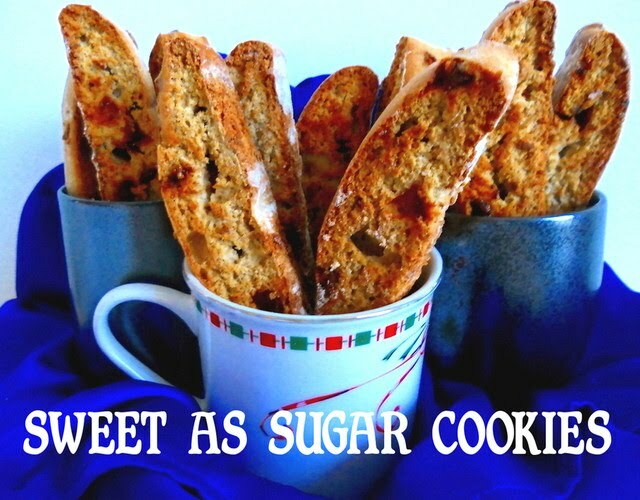 Combine the melted butter with the sugars. Mix in the cocoa powder. Beat in the egg and vanilla. Combine the flour, baking soda, and salt. Add half the flour mixture and beat well to combine. Add in the hot water and mix well. Add in the rest of the flour mixture and mix well. Divide the batter evenly between the two prepared pans. Bake for 30-35 min., or until a toothpick comes out clean. Remove from the oven and let cool in the pans for 10 min. Remove from the pans and let cool completely on a wire rack. Line one of the pans with plastic wrap. Fill with the mint chocolate chip ice cream and smooth out evenly. Freeze till firm, about 30 minutes. Place one cake layer on a plate. Remove the plastic wrap from the ice cream layer and place the ice cream onto the first cake layer. Top with the second cake layer, wrap around with plastic wrap, and freeze till firm, about 1 hour. Remove the cake from the freezer. Frost with the green buttercream frosting. Pipe rosettes of white frosting on top. Decorate with the chopped Andes mint candies. Melt the chocolate chips in the microwave and pipe dots on the sides of the cake (they'll harden instantly). Keep in the freezer till ready to serve. The buttercream frosting will be a little difficult to spread on the cake at first, since it will have a bit of trouble sticking to the ice cream part. But, as you keep working, the frosting will harden on the frozen cake making it easier to work with.